I can’t wait to see what you guys come up with. 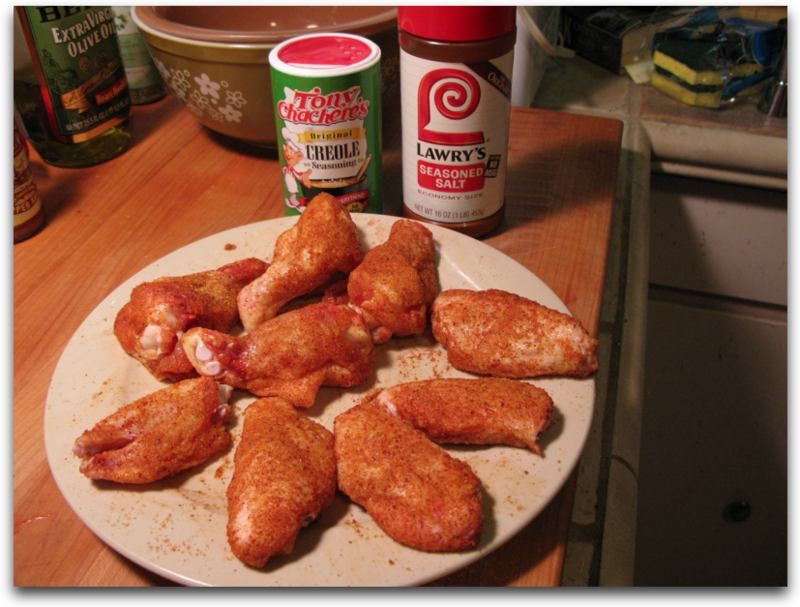 One of my top 2 favorite wings ever is your version of Symon’s sriracha wings. But….but….I only have one vac sealed bag of prepped wingettes & drummettes left, how am I supposed to choose just one type this week? Hey Chris, I guess you just have to cook ’em up with whatever you have on hand, and then go buy some more wings for the next batch! Both of our seasonings already have plenty of salt, so you may not need the seasoned salt at all. Thanks for letting me know about More Spice. If I can’t find it locally, I’ll definitely be ordering this from your website. I’m going to take your advice and leave out the seasoned salt next time. Thanks for stopping by HotSauceDaily! The vinegar would make a great taste. we made these, they were good, but way too salty. We were thinking leaving the table salt out and using malt vinegar instead of white, or leaving the season salt out. I agree, Patty. We left out the table salt the next time we made them. Hey Lisa, thanks for letting us know. Did you leave out the seasoned salt? Next time I make these I’m going to try and pair of them with a hot sauce. The sriracha garlic wings rock! The marinade is simple yet so important. Hey Guys I’m making some now…I washed and soaked them in white vinegar and a beer with lemon pepper,garlic salt, garlic powder and salt. I baked them on a Rack under a cookie sheet. Then I will taste them to see if I want to add sea salt..I may dip them in viegar I mat even deep fry a minute on each side..Just waiting now. I will keep you posted,,Good day..
Wow… that sounds good. Can’t wait to hear what you think of your recipe. Thanks for sharing that with us all. Super easy and really tastey. We just finished our first attempt and went with 1/2 salt as recommended and, indeed, I cannot imagine them with the 2 tbl. But even at half the salt we felt that we will cut that down a bit the next time. That said, for sure we will be keeping this recipe and making it again. I’m with you on the salt content Steven. But I like how unique and tasty this wings are. Thanks for the nice comment. Just wanted to say the salt & vinegar recipe is a hit! Although I went a step further and reduced you seasoned salt reduction by half of that, it was still salty but oh man…it was a success! Thank you for sharing- that’s a great recipe!! Thanks Dan! I really like it too, and agree that halving the seasoned salt is a must. 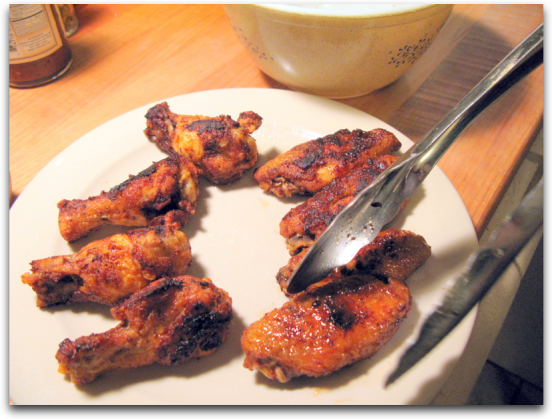 I make these all the time, but I have to bake these for 35-40 minutes @375 AND deep fry @375 (electric fry pan, oil 3 in deep) for 6-7 minutes to get these wings crispy. Sometimes I add Garlic Powder to the Vinegar bowl for a interesting change and/or ground dried Habenero powder to make HOT Salt And Vinegar Wings. 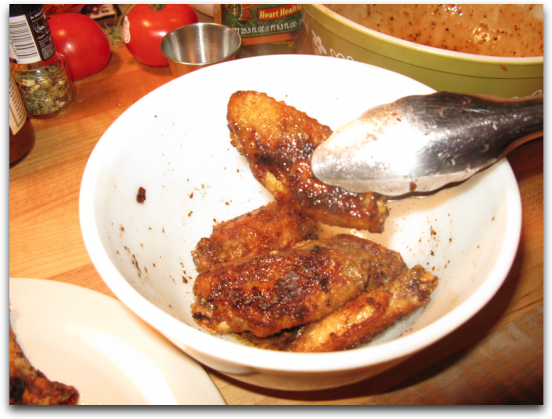 When I first stumbled upon the recipe for Salt and Vinegar wings, I was blown away by the concept. By reducing the salt content, I found them much more palatable. I like your idea of the garlic powder. I had to go with ” Slap ya mama” instead of tony’s. Wonderful wings though. Will make them every hockey night. Thanks for the recipe. Well, thanks for the tip Rev Bobbo! I’ve not tried it yet. You can purchase various sizes and flavors of Slap ya Mama here. Looks good! (salt and vinigar wings) but, how do you download a copy of the recipes? We currently don’t have a recipe “plugin” to allow downloading or printing recipes. But thanks for reminding me that we should set that up. I’ll email you the recipe. It’s not the amount of salt that’s the problem, it’s the TYPE of salt. Use 2 teaspoons (not tablespoons) of KOSHER salt and you’ll be fine. The Kosher salt is larger grain, crunchy, and less than half the salt of table salt. Good times. @Irene thanks for the suggestion. I would normally completely agree with you about using Kosher salt, but I think in this recipe, part of the flavor and texture comes from the table salt. Having said that, I’m thinking a really “fine grind” of Kosher would be a good improvement – perhaps using our spice grinder to get the Kosher salt down to the table salt consistency. Again, thanks for the great idea! Have you tried making these wings yet? I’d love to know how you liked them. Cool! Please let us know how you like them! (I’d go easy on the salt, as mentioned in the post).